Not only do they provide Merchant Accounts for those that need to be able to accept credit/debit cards to do business, and do so at remarkably good rates, but they manage to give back to the community that makes it possible for them to exist. Some people talk a good game, but these folks are actually doing it. In 2016 Dharma Donated Over $100,000 to Nonprofits : Amazon Watch: Protecting the rainforest and advancing the rights of indigenous peoples in the Amazon Basin. American Foundation for Suicide Prevention: Dedicated to understanding and preventing suicide through research, education and advocacy. David Brower Center: We’re a home for the environmental movement. Green America: Promoting ethical consumerism. Insight Out: Reforming the prison system from the inside out. Mahamevnawa Meditation Monastery of California: Provide a quiet, peaceful refuge for all humanity (both Buddhists and non-Buddhists alike). Mindful Peacebuilding: Engaging societal challenges with the energy of mindfulness. Planting Justice: building permaculture garden, working with schools to develop food justice curriculum, and creating jobs for men transitioning from prison. Prison Mindfulness Institute: Providing prisoners, and those who work with them, with the most effective contemplative tools for self-transformation and rehabilitation. San Francisco Zen Center: A network of affiliated Sōtō Zen practice and retreat centers in the San Francisco Bay area. Sanghapala Foundation: Supporting Abhayagiri Buddhist Monastery, a Theravadin Buddhist monastery of the Thai Forest Tradition. Seva Foundation: Working to prevent and cure blindness and visual impairment among impoverished communities in the developing world. Tricycle Magazine: An independent, nonsectarian Buddhist quarterly that publishes Buddhist teachings, practices, and critique. Veteran’s Path: Support returning veterans in their transition home. I’m suggesting that if you need a Merchant Account, why not deal with a company that is going to put some of that money to good use? You get what you need, and you get a great feeling about how you’re doing business, knowing that you’re “paying it forward”. Heck, their most loyal customers are the ones just like you that are looking to have a positive impact on the world; to leave the planet just a little bit better than the way they found it. They have certainly started off well with an A+ rating from the Better Business Bureau, having only one complaint filed in the last seven years (since 2007). They are listed as a Preferred Reseller for Authorize.net; they are in the top 10% of all B-Corps for Worker Impact — B Lab, a nonprofit organization, certifies B Corporations, the same way TransFair certifies Fair Trade coffee; Dharma is also a Charter Member of Conscious Capitalism; a Gold Member Certified Business for Green America; and Dharma Merchant Services gets a 5 out of 5 from Merchant Maverick. As an alternative for billing services there is free iPhone processing with all new accounts, and swipers are only $99 each.. You don’t even need a swipe attachment; just use the built-in camera on your Smartphone and the app can get those encrypted numbers off for approval without ever storing the customer data on your phone. What could be more secure? Of course they offer everything you need, from systems that can use your own iPad as a Point-of-Sale (POS) device, to wireless terminals, to cash-registers and cash drawers. 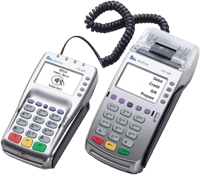 Their favored terminals are the new Vx520 and FD130, which is fully EMV-capable, which they will program, test and ship to you for about $269. It is Apple Pay and NFC (Tap-n-Go) ready, with an integrated printer for receipts, with a PIN-pad, and compatible with both dial-up & IP connection. If you need the external PIN-pad, that will cost you another $170-$200. Their eCommerce terms are Interchange-plus pricing (interchange plus 0.35% + $0.15 per transaction). They charge a $17.95 monthly fee that includes PCI compliance, a $20 fee if you need access to Authorize.net (a payment gateway with a $49 one time setup fee, with only a 5¢ fee per transaction), and there is a $25 account closure fee upon termination of service. There are no Early Termination or Application Fees; no Annual fees or Monthly Minimum. You’ll probably never pay that $25 fee unless you close your business and stop accepting credit/debit cards and other financial instruments for a business. On a sample sale of $100, VISA debit/reward/retail vary between 90¢ and $2.34; MasterCard $2.79; AMEX varies depending on whether it is restaurant, retail, wholesale, healthcare, travel & entertainment, services, or Non-Profit from 2.05% to 3.55% (plus 20¢ per transaction). Very reasonable. Their Retail Swipe Terms are Interchange-Plus 0.25% + $0.10/transaction. On a sample sale of $100, VISA debit/reward/retail vary between 75¢ and $2.19; MasterCard $2.64; AMEX varies depending on whether it is restaurant, retail, wholesale, healthcare, travel & entertainment, services, or Non-Profit from 2.05% to 3.55% (plus 20¢ per transaction). As you can see, extraordinarily inexpensive. Dharma is EMV and PCI compliant, from their software for your iOS or Android Smartphone, to the wireless or hardwired terminals for your POS system. Store & Forward technology is still available through certain standalone terminals and will be a continued feature for Dharma accounts should merchants need this functionality. The PCI risk is too high for this functionality if someone steals your iPad or iPhone with customer data on it and store/forward will not be allowed on mobile devices. You don’t want to be responsible for monetary loss or identity theft of a customer. Instead, with their EMV compatibility, you can accept payments even if you don’t have a live connection to the internet for processing. EMV has relevant information on the card itself from the last time it connected to the internet for any reason (like a recent sale). That little chip “knows” that it has (for example) $375 worth of daily limit left and can autonomously authorize a sale, for which you get paid up to its limit. That is so much more convenient when the network is bad, or if you happen to be a retailer at a computer show and your booth is in the basement with a terrible internet connection. Besides, by requiring the PIN number when using the card, you are reassured that the person with the card is the actual owner, and your client feels reassured that they are secure with the security precaution. They are extraordinarily reasonable and have no long-term service agreements or cancellation fees. There is nothing but praise for the customer service. People specifically mention that there is no difficulty getting through to kind, understanding people that sincerely care about solving your problems as quickly as humanly possible. Rather, they seem to be stunned by the high quality service when coming from just about any other provider. Read the Testimonials below for a sample. Brigette Z. from San Diego says “After 10+ years [with a different company], we’ve switched to Dharma. We’ve been with them for two months or so and we couldn’t be happier… absolutely stellar customer service… we saved about $1200 last month … Thank you, Nick and Dharma … you couldn’t be any better! Nate A. from Scottsdale says: “The dream team over at Dharma is just that! It’s rare you get radical customer service coupled with authentic care and support for your business…but that seems to be the standard with Dharma… A high level of service is extremely valuable, but they also give [to] the charity that I work for, Little Kids Rock… I wish there were 6 stars allowed…they would get ’em all! There has been but one single complaint since 2007, when the company started operations. It stemmed from a customer not abiding by their account agreement, exceeding their permitted monthly amount, and even breaking bills into two parts to bypass the limits agreed to. The account was closed by a partner responsible for handling payments. The money on hold by the partner firm was paid and the complaint was closed. High risk quotes are given on a case by case basis. Please either call number on Visit Site page or submit form. Thank you. 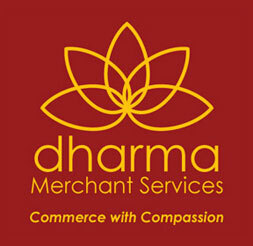 Dharma Merchant Services is the ultimate feel-good service for people that need to use credit tools such as credit or debit cards, checks, prepaid cards, Apple Pay, or NFC products like Tap-n-Go. They give back to the community by donating directly to non-profit companies; they source all their materials from Green Suppliers and Sustainable Manufacturers; they offer the lowest rates for this essential service; they have fantastic Customer Support. If you’re having any doubts about your current service provider, start making plans to switch when your contract is up. Heck, they’re so economical it might be worth paying the escape fees with your current provider just to get on with your business without all the hassles. As of October, 2015 your business can be held liable if you accept a credit card that was stolen, lost or fraudulently replicated. * we never sell or rent your information to anyone.